Cyclohexanone is a colorless flammable liquid,with the smell of acetone,it is slightly soluble in water and soluble in alcohol and ethylether. It is vloatile and its vapor can form explosive mixture with air,the explosion limit is 1.1%-9.4%(vol). It is irritant to eyes,nose and throat ,but not corrosive. It should be contained in clean and dry tank cars or galvanized iron drums and tightly sealed. An indentification label and a “flammable matter” sign should be steadily attached on the drums. It should be stored in dry,well ventilated storehouse,and isolated from fire. The storage period is 3 months.During transportation,shocks should be prevented to avoid damaging the welds on the drums. Do not expose it to sunlight and rain. 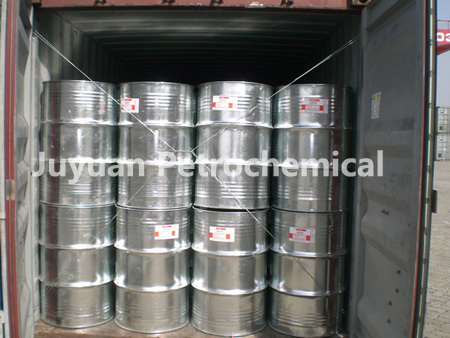 Applications:Used for making adipic acid,caprolactam etc.,as well as dyes,insecticides,paints,resins,solvents and so on. In medical industry,it can be used to make progesterone and so on. Cyclohexane is the six-membered alicyclic hydrocarbon consisting of six carbon atoms linked to each other to form a ring, with each carbon atom bearing two hydrogen atoms, C6H12. A cyclic compound is an organic compound that contains one or more closed rings of carbon atoms. The term alicyclic refers to cyclic compound that behaves chemically like aliphatic compounds (open-chain), which means the exclusion of carbocyclic compounds of aromatic rings with an array of ヰ-electrons characteristic. Cyclohexane is a colorless, highly flammable, mobile liquid with a pungent odor. It is insoluble in water and soluble in alcohol, ether, and almost organic solvents. Cyclohexane is a non-corrosive and quick volatilize liquid and sublimes between -5 to 5 C. Cyclohexane can exist in a number of interconvertible three-dimensional conformations, the two simplest being are the chair and boat conformation and others include the half-chair and twist-chair conformation. Cyclohexane can cause irritation to the eyes and mucous membranes in workers. Repeated and prolonged contact with skin may cause dermatitis. The substance has not been shown to cause the hematologic changes associated with exposure to benzene. Cyclohexane occurs naturally in crude oils. Some cyclohexane is recovered from petroleum streams by fractionation. The bulky commercial production of cyclohexane is based on hydrogenation of benzene in closed system. Cyclohexane consumption is linked almost entirely to nylon production. Nylon is further processed into fibers for applications in carpeting, automobile tire cord, clothing, and other growing industrial fields. Cyclohexane is used as a solvent, oil extractant, paint and varnish remover, dry cleaning material, and in solid fuels. It has been used as a insecticide itself. Cyclohexane is used as a chemical intermediate to produce target molecules. Natural compounds of one to five alicyclic rings with great variety and complexity are found particularly in steroids and terpenes. Cyclohexane structure, six membered-ring, is one of the major skeleton in nature. Cyclohexane derivatives can be used for the synthesis of pharmaceuticals, dyes, herbicides, plant growth regulator, plasticizers, rubber chemicals, cycloamines and other organic compounds. Cyclohexanone is a compound of ketone family. It is a clear oily liquid with an acetone like odor; slightly soluble in water but completely miscible with commom solvents. It is used as an industrial solvent and activator in oxidation reactions. It is used in the production of adipic acid, cyclohexanone resins, cyclohexanone oxime, caprolactam and nylon 6. Cyclohexanone having two alpha-carbons in the ring provides four alpha-hydrogens which can be substituted depending on the reaction conditions with remaining six hydrogens unreact.